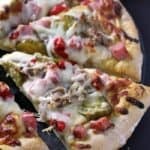 Slow cooked pork and sweet bread and butter pickles are just the beginning of this outstanding Cuban-inspired pizza. Put all of the ingredients for the pork in a slow cooker. Cook on high 4 hours or low 6-8 hours. Remove the meat and shredded. Store the meat in a covered bowl, adding plenty of juices from the crockpot to moisten, until ready to make the pizza. Heat the oven to 425F with the pizza stone in the oven. Heat an extra 10-15 minutes to ensure the stone is thoroughly heated. Meanwhile, combine the mustard and cream in a small bowl. Prepare the rest of the ingredients for easy pizza assembly. Roll out the pizza dough. Remove the pizza stone from the oven and layer the dough on it. Spread the mustard sauce. Layer 1/2 c Swiss cheese and 1 cup mozzarella. Layer half the pork and all of the ham, pickles, roasted pepper, and onion. Top with the remaining 1/2 c Swiss cheese and 1 cup mozzarella cheese. Bake at 425F for 13-15 minutes until cheese is melted and lightly browned and crust is cooked through and golden. Enjoy this Cuban pizza awesomeness immediately. Yields 4 servings. This pizza does not require a full pound of pork - I used half of it and served the remaining on sandwiches for lunch the next day. My Sam Adams Beer Pizza Dough​ makes enough dough for 2 large pizzas. So, half can be frozen or used to make a different pizza.